Each year we invite a player who is or was famous as a child star to host the International Youth Championship. 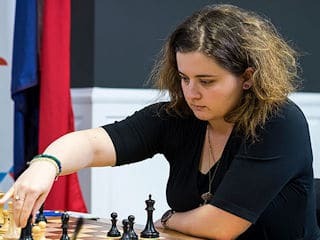 The current U.S. Women’s Champion, Sabina Foisor, has won medals at the European Youth Chess Championships in various age categories. Her result at 2007 European Women’s Championship qualified her for the Women’s World Chess Championship 2008 in Nalchik, Russia. Both her parents are International Masters and were multiple Romanian chess championship medalists. Sabina learned to play chess at the age of 4 and entered her first tournament at the age of 6. Aside from playing chess professionally, she gives chess lessons to players of all levels. She has been an instructor at our Grandmaster Chess Camp. Sabina moved to the United States in 2008 to study at the University of Maryland. She has represented the United States on the USA’s Women Chess Olympic Team at four consecutive Olympiads and three Women’s World Team Championships. In addition to hosting the youth championship Sabina will give a simul for young players at 6:30 p.m. on Saturday. She will also participate in the opening ceremony and an autograph session.